Actor Comedian Tracy Morgan has reached a settlement with Walmart almost a year following the deadly crash on the New Jersey Turnpike that killed one and seriously injured Morgan and others. 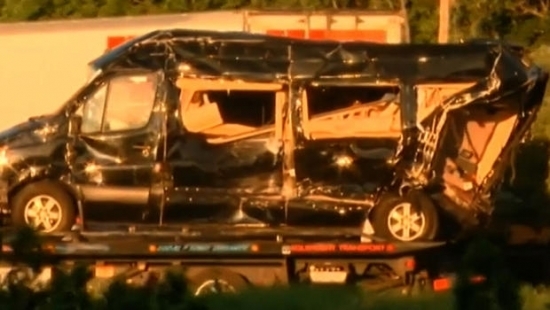 The accident happened on the northbound turnpike on June 7th, 2014 when a Walmart truck driven by Kevin Roper slammed into the back of a nearly stationary limo bus with Morgan and friends. Comedian James "Jimmy Mack" McNair died. Morgan suffered severe brain trauma, a broken leg and ribs, and is still recovering. Two other passengers were also seriously injured. The driver of the truck faces charges of vehicular homicide. He was driving 65 in a 45 mph work zone. There have also been questions about how long he had been awake and if he had proper rest before driving, hence being alert enough to react to the stopped traffic. The details of the settlements between Walmart and Morgan have not been disclosed. Philadelphia police as asking the public's help identifying a suspect who threw hot tea in the face of a takeout food worker last Thursday night in the Kingsessing neighborhood. It happened at the Panda Chinese restaurant at 5441 Baltimore Avenue around 9:30 p.m. on May 21st when three men entered the store. One of the men began to argue with the female employee behind the counter and tossed a cup of hot tea on her. She was taken to Mercy Hospital to be treated for burns to her face and chest. The men fled on foot. The suspect is believed to be in his 20's with a thin build and beard. He was wearing a hoodie with a distinct pattern on the chest and sleeve. Police would like to talk to the other two men as well. The entire incident was caught on surveillance tape. Philadelphia police have released video of a suspect wanted for sexually assaulting a woman inside her home in Point Breeze on Monday morning. It happened at 5:30 a.m. on the 1800 block of S. Rosewood Street. The 35-year-old victim woke up to find the man standing over her bed. He placed his hand over her mouth, demanded money, and then sexually assaulted her. He took $10, her car/house keys, and her roommate's ID before fleeing. Police believe he entered via an unlocked door and waited in the shower for hours until the woman and her roommate were asleep. He is described as a black male, late 20's/early 30's, 6' to 6'2”, medium build, wearing a mask, wool hat, black pants, black long sleeve zip up, and red/orange gloves. If you have any information please contact Philadelphia Police Special Victims Unit at 215-685-3251.